Paris’ bid to host the 2024 Olympic and Paralympic Games has launched what it calls an innovative new program to engage, educate and inspire French youth and those around the world. The program, developed in collaboration with UNICEF and PLAY international with support from the French National Olympic Committee (CNOSF), is known as “Playdagogie – values of Olympism” and uses sport and Olympic values as a learning tool to encourage social development in children. Tony Estanguet, co-chair of Paris 2024, London 2012 Olympic basketball silver medallist and Paris 2024 Education Ambassador Emmeline NDongue, and Laurence Fischer, Karate World Champion and member of the Paris 2024 Sport and Society Committee, joined children at a primary school in central Paris on Thursday to introduce the program. “Playdagogie” is a training technique that helps children learn and grow through play, and is based on methodology successfully developed by PLAY International and its partners in countries such as Kosovo, Bolivia, Afghanistan, Burundi and Haiti. The new program created by Paris 2024, UNICEF, Play International and the CNOSF, builds on the established approach of using games and sport to build knowledge and develop life skills by bringing in the concept of Olympism and integrating the Olympic values of friendship, excellence and respect into educational content for kids. One of the core pillars of the Paris 2024 bid campaign is to draw on the Olympic values to engage the people and deliver real community legacies, strategies that can be shared abroad to help drive broader positive social change around the world. 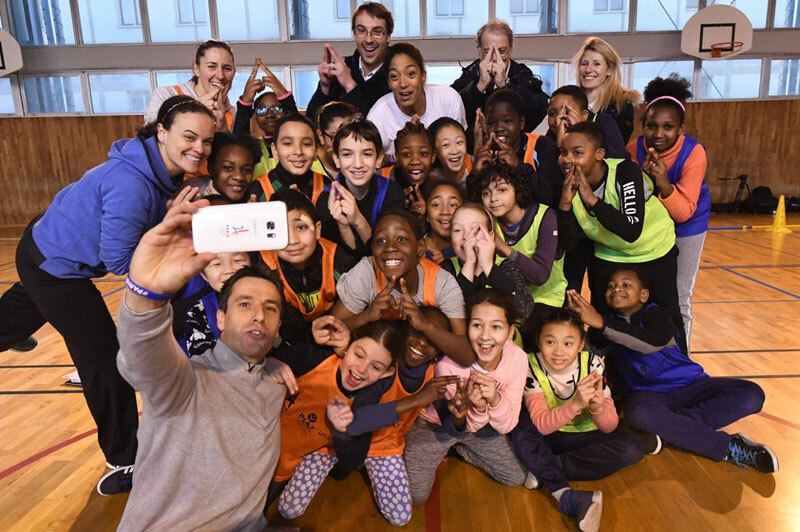 The launch of the initiative coincides with the start of a week-long celebration of sport and the Olympic values in schools and universities around France. National Olympism and Paralympic Week will see children across the country take part in activities and events, encouraging them to discover and learn about the Olympic Games, its values and the importance of sport and physical activities in their daily lives. Paris is bidding alongside Los Angeles and Budapest to host the 2024 Games. The International Olympic Committee (IOC) will select the host city September 13 in Lima, Peru.